The hook over is ideal for field, pasture, trailer, or stall. 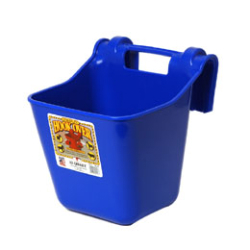 The durable, molded bracket easily hooks over any 2-by wide board to instantly deliver a sturdy feed bucket. For more permanent installations simply install two screws in the holes provided.